Directed by Al Reinart, For All Mankind is a film about the Apollo program from NASA that would send astronauts to the moon. The film is a documentary that relies on the footage from those events as it’s told by some of the astronauts who would land on the moon during an intense space race against the Soviet Union in the 1960s. The result is a mesmerizing and evocative film from Al Reinart. Featuring largely footage from the nine manned-missions to the moon from 1968 to 1972, the astronauts from Apollo 8 to Apollo 17 tell their stories through audio interviews and recollections about the missions from liftoff to returning to Earth. It’s a film about these missions that were considered monumental in the history of the 20th Century as the film begins with President John F. Kennedy’s speech about wanting to go to the moon and to do the impossible. Compiling more than 80 hours of footage into an 80-minute film, Al Reinart chooses footage to help tell a straightforward narrative from ascent into outer space and then back down to Earth. 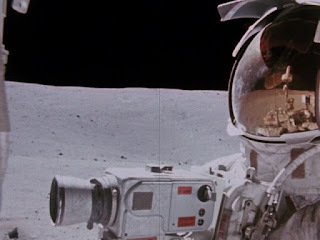 With the aid of editor Susan Korda in compiling many of the footage the astronauts filmed as well as the scenes in the control centers in Houston and Cape Canaveral. 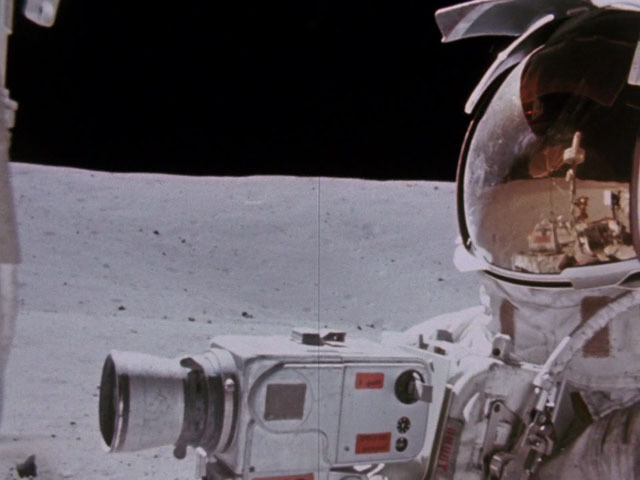 The footage showcases what the astronauts see in space and life in and out of the space capsules including the landing of the Apollo 11 LEM on July 20, 1969 which would be a historical day. There’s other moments that is shown as well as a moment where one of the astronauts drops a feather and a hammer at the same time proving Galileo’s theory on what happens when there’s no atmosphere as it proves that Galileo was right. With the help of sound editor Bill Wistrom, Reinart also compiles the many interviews from the astronauts who were part of the program as they all talk about what they were doing on the moon or what the capsule pilots were doing orbiting the moon. Adding to the film’s evocative tone is its music by ambient music pioneer Brian Eno. Consisting material from albums Music for Films III and Apollo: Atmospheres and Soundtracks with some of the contributions from those albums from Daniel Lanois, Roger Eno, and John Paul Jones. The soundtrack also features music that the astronauts played ranging from classical music pieces as well as contemporary music from Frank Sinatra and some country music from Merle Haggard and Buck Owens. For All Mankind is a phenomenal film from Al Reinart. It’s a film that tells the story of the Apollo program and the astronauts who were part of something very special that is very unlikely to be replicated again in the 21st Century. In the end, For All Mankind is an incredible film from Al Reinart.